I help manage the Sabrina Carpenter Fan Club, and your message was forwarded to me from artist management. 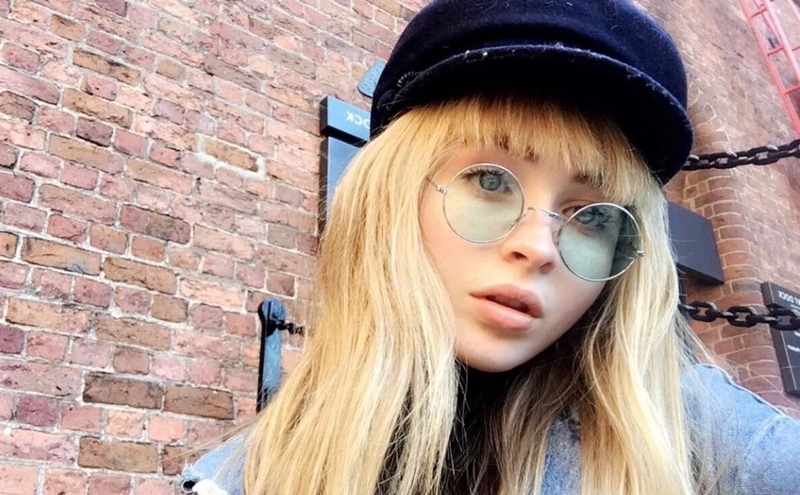 As a member of the Sabrina Carpenter Fan Club, you would join a community of fans who enjoy the music that Sabrina creates and performs. We'll keep members updated on Sabrina's activities, her music and her live performances when she goes on the road. This includes inside looks of the tour and messages from Sabrina. With the help of our members, our goal is to grow Sabrina’s fan community so more music fans worldwide learn about this talented star. 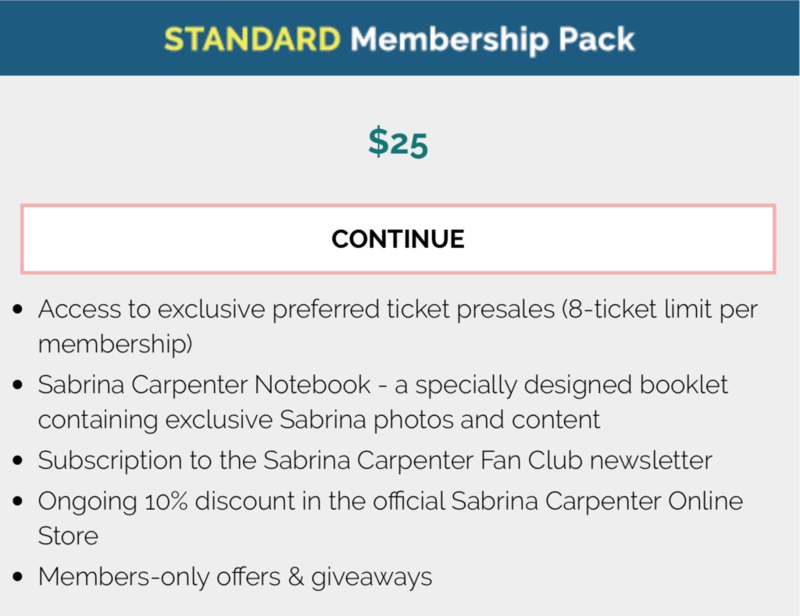 You may have seen that a Standard membership subscription comes with a Sabrina Notebook, which will contain personal messages and photos from Sabrina. 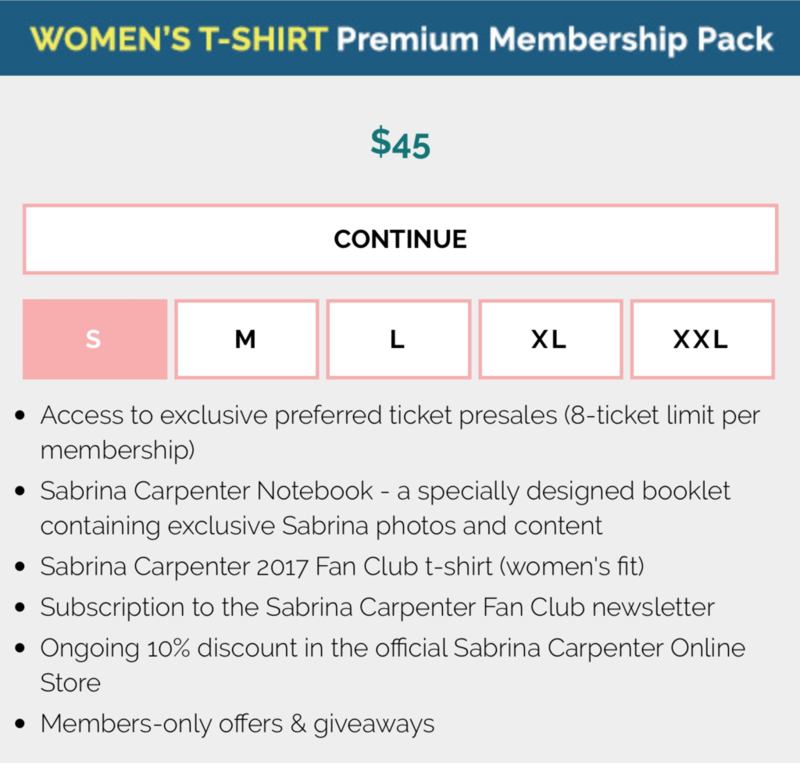 Fans who choose the Premium member kit also would receive an exclusive t-shirt featuring Sabrina’s portrait (a photo taken by her sister!). Thank you for being a fan of Sabrina. We are delighted to hear from fans who appreciate her music. The Site is directed to people residing in the United States. We do not represent that Content available on or through the Site is appropriate or available in other locations. We may limit the availability of the Site or any service or product described on the Site to any person or geographic area at any time. If you choose to access the Site from outside the United States, you do so at your own risk.